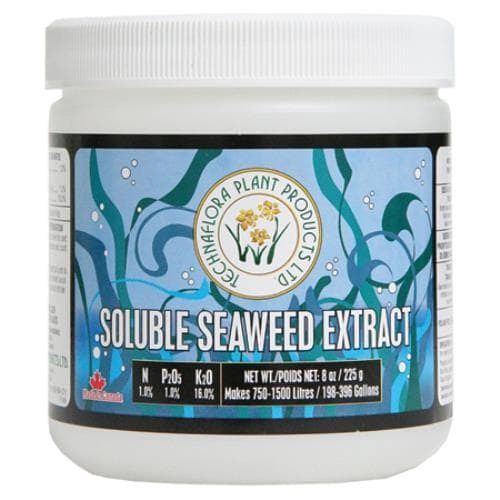 Soluble Seaweed Extract™ is a concentrated, comprehensive gardener’s tool in powder form. The concentrate is made from 100% pure, organic Norwegian kelp, Ascophyllum Nodosum, which is harvested on the Atlantic Coast of Canada. This highest-quality kelp is a rich natural source of over 60 chelated nutrients, vitamins, amino acids and naturally occurring hormones that stimulate plant growth, and has been celebrated for its natural fertilizing properties for centuries. Enhanced seed germination, promotion of a healthy root system, and rapid stem and shoot development are among the recognized benefits of using this kelp extract. Versatile Soluble Seaweed Extract™ can be sifted with soils to create custom blends for planters or added to the hydroponic reservoir. It can also be stirred with water to create a liquid for use as a foliar spray. Guaranteed not to clog emitter lines, the fine seaweed concentrate will pass through 1:50,000 sieves. Concentrated kelp is an exceptional value for all growers: in powder form, Soluble Seaweed Extract™ can be stored indefinitely. Soluble Seaweed Extract, from Technaflora Plant Products, is a water soluble powdered form of Norwegian sea kelp, Ascophyllum Nodosum. Whether used in soil, hydroponic systems or as a foliar spray, regular application of Soluble Seaweed Extract™ will enable the grower to reap the benefits of the power powder from the sea.